etherFAX will no longer be supporting TLS version 1.0 for secure communications after June 30th, 2018. In order to align with security industry best practices and changing regulatory requirements, this change will be made for all of etherFAX’s Internet facing web sites and systems. TLS stands for “Transport Layer Security.” It is a protocol that provides privacy and data integrity between two communicating applications. It is the most widely deployed security protocol used today and is used for web browsers, FTP clients, and other applications that require data to be securely exchanged over a network. TLS ensures that a connection to a remote endpoint is the intended endpoint through encryption and endpoint identity verification. The versions of TLS, to date, are TLS 1.0, 1.1, and 1.2. Client web browsers, FTP clients, and connection applications may use TLS as a component of their security. etherFAX highly recommends the use of TLS 1.2 for all communications. All etherFAX API’s are requiring action to disable TLS 1.0 by June 30, 2018. On that date etherFAX will disable support for the TLS 1.0 encryption protocol, which will prevent customers from using it to access etherFAX services. This change is important to protect the security of our customer’s data while they interact with our systems. How will customers be impacted? After etherFAX disables TLS 1.0, any connections to/from etherFAX that rely on TLS 1.0 will fail. This may impact a number of etherFAX services including all REST and SOAP API interfaces, fax server connections, customer portals, and partner portals. After this change the minimum supported Microsoft OS is Windows Server 2008 R2. Server 2003 will cease to function. etherFAX A2E devices are not affected by this change. How can customers avoid a service disruption? The action required by your organization will depend on the method by which the etherFAX services are accessed and from what OS version they are being accessed from. Ingenium Customers utilizing a fax server application or etherFAX API integration should contact us for more details on any required changes or updates. It may come as a surprise with the ubiquity of the Internet that the Fortune 500 still rely on fax technology for mission critical applications. The nation’s largest retailers communicate between stores and distribution centers via fax technology, for example. Fax technology allows them to transmit sensitive data such as credit card (PCI) and ordering information securely between stores and distribution centers requiring without traversing the Internet or email. Other applications include HIPPA and EDI applications that the Fortune 500 relies on every day that have to be secure. Read the article on LinkedIn. As organizations continue to find ways to cut costs, improve the customer experience and reduce risk, we are talking with customers a lot about strategies to move their fax server to the cloud. If you are using an on premise RightFax server, chances are that your organization has written code from your back office applications to RightFax that enables seamless faxing. In this case, moving RightFax to Ingenium’s FaxColo would allow you to maintain the integration you built while leveraging cloud infrastructure to power and process faxes for you. The benefit is you still have control over you data but don’t have to deal with the computing or Telco infrastructure required to provide your fax services. In a situation where you want to keep your fax server on site, we offer cloud based Telco that connects securely to RightFax thru a software based connector. As faxes are sent and received, they are encrypted and delivered over the PSTN. In this scenario, you are basically trading up from your in house Telco provider to a highly scalable, highly secure cloud based Telco network. Many of our satisfied cloud customers have reported to us that they have increased fax sending rates up to 100%. Some of our clients are using a fax server as a point solution to send and receive desktop based fax and want to go with an all cloud fax experience. In this case, we offer Fax2Mail, the largest business to business fax network on the planet. With Fax2Mail, companies can stop upgrading their fax server and paying for annual maintenance. With Fax2Mail, you pay a monthly usage fee, based on how many fax users, fax numbers and fax pages that you send. All of our cloud fax solutions are HIPAA and PCI compliant. For a free, no obligation analysis of how much you could be saving by leveraging our proven cloud technology, please contact us. Increasing reliability between RightFax and a Brother MFC. Many small businesses and satellite offices find that using Brother multi-function devices (MFC) are a great way to combine printing, copying, scanning, and faxing into one easy-to-use and cost-effective device. But with the proliferation of Fax over IP (FoIP) RightFax administrators have found their error rates increasing when communicating with the Brother MFC’s. There’s a simple answer to why this error rate has been increasing over the last few years. The most common problem that we see here at Ingenium software with communicating between enterprise FoIP solutions like RightFax and Brother MFC’s is the telephony connection between the Brother device and the telephone company. The issue is the interface between the Brother device and a Voice over IP (VoIP). One of the faxing gurus at Brother had this to say on how to increase reliability for Brother devices connected to a VoIP phone system: “What people keep forgetting is that fax technology is based on a circuit-switched connection model, not a packet-switched model. It [fax] can work in a packet-switched environment but there may be some issues. This is what the compatibility mode is for [on Brother devices]. If the customer is using a VoIP system, they should set the compatibility mode to ‘Basic’ for the most reliable performance. Hopefully this information will help you, the RightFax administrator assist your end customers getting the highest reliability from their Brother devices when sending and receiving faxes to your RightFax environment. People often ask me if T.38 fax is as reliable in an IP network compared to traditional analog or PRI faxing. My answer is “Yes and No”. This question seems simple enough yet there are so many variables that need to be examined and understood. T38 vs G711; Which codec is better? Most of the time we suggest T.38 for fax but there are customer and carrier network environments that lack certain IP transport capabilities within the gateways they are using so G.711 ends up working better. I can’t tell you how important Error Correction is in fax. ECM is part of the fax communication process between two fax devices. ECM does all kinds of cool stuff like deciding how to compress the transmission and which lines in the fax transmission need to be resent to the receiving device to complete the fax, and so on. Some media gateways and PBX manufactures such as Avaya do not support ECM at all. So you may be faced with the decision of doing the best with what you have and choosing T.38 with no ECM or G.711 with ECM. In an Avaya environment we always suggest a dedicated fax gateway such as the Dialogic or OpenText Fax Gateways. These gateways are designed especially for fax traffic and do an excellent job of converting analog or PRI into SIP. One of the most common issues we see here at Ingenium with fax in an IP enviornment is right after a company switches their telephone provider from analog or PRI to a VoIP carrier and completely overlooks the need for fax support; specifically T.38. Not all carriers are equal. Just because your carrier can support voice over VoIP does not mean they can support Fax. 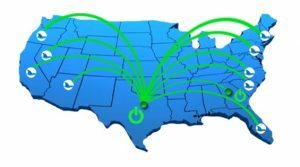 Many local carriers have been moving their backbones to SIP wholesalers so they can get cheaper rates. When fax traffic hits these SIP backbones, we see all kind of issues like delay, lost packets and altered data. Take for instance AT&T, who has one of the largest telephone networks in the United States. AT&T has so many local POPs, it would be financially impossible for them to replace all of the legacy TDM gateways and switches they have in the field to support T.38. So they do crazy things like pushing SIP services from behind MPLS connections that do not offer QOS or error logging for T.38/SIP invites. So, they can’t troubleshoot their own network when a customer complains about failed calls, disconnect errors and false positive fax transmissions. In our experience, Verizon also has issues with providing T.38 over H.323 inside their network in some local markets. Verizon recently started upgrading their voice gateways in the south east to Avaya. But remember, Avaya does not support ECM. Our favorite carrier for supporting T.38 is Global Crossing, who was recently acquired by Level 3. These guys have a superior IPv6 network from the ground up. I have been in the belly of this global network and have personally seen the core switching environment which, by immaculate design, converts all transports and signaling into SIP on the fly, and back to TDM or whatever transport the call route ends up being delivered to. They also monitor every single SIP session and can analyze all SIP conversations to scientifically and undisputedly peel back the twisted pairs and tell you exactly why the call failed or who’s network is not speaking the right codec. I have been totally impressed with their technical capabilities and support execution. We have a 99% fax success rate with Level 3. That’s better than most TDM networks. Many of our clients have sucessfully virtualized their RightFax servers and are using SIP/T.38 for faxing. In order to be successful, you have to inspect what you expect. We suggest trying out this technology first before you make a buying commitment. Ingenium offers trial RightFax 10 software with the Dialogic T.38 codec option for validating your network and carrier compatibility with FoIP. Our expert systems engineers can remotely install and configure the trial system in less than a day, in most cases. Our engineers will work with your IT department to help fine tune and validate your network for supporting fax over ip. For high volume users, we can also stress test the system to ensure network performance under a live fax load. By testing before the customer buys the software, everyone involved has an opportunity to see how fax over ip will work within their specific network. Ingenium adheres to the Payment Card Industry Data Security Standards (PCI DSS 2.0) and is reguarly audited by an approved PCI QSA. Ingenium has also completed the SAQ D for Service Providers. Ingenium fax hosting service customers don’t have to worry about thier buyer’s payment card security or about compliance with PCI DSS for managing fax data for thier business. Ingenium’s PCI Fax Hosting Service provides secure and auditable faxed reception of credit card order forms that are securely presented to our service customers for payment processing. Document retention policies can also be specified to permanently destroy fax documents after a specific date. information. PCI DSS is a requirement for all credit card merchants that store, transmit, or process payment card information. How does my business become PCI compliant for fax payments? Ingenium is a trusted Strategic Solutions Provider for global voice, fax, secure email and cloud computing services. We are extremely passionate about what we do and who we serve. We consider ourselves an extension of your IT or Business Team when it comes to solving your needs. Ingenium markets our fax transport services thru our faxserver.net brand. Copyright © Ingenium Software. All Rights Reserved.